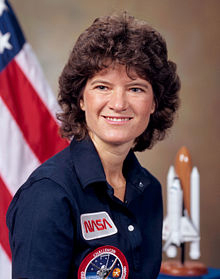 Sally Ride was the first American woman in space. If you are of a certain generation you already know that, and probably have a vague mental image of her mane of dark curly hair, her wholesome good looks and easy-going smile. If you were born after 1983, you probably know even less of her. That is your loss, for this was a very remarkable person, someone who mattered. Sally and her younger sister Karen, daughters of Presbyterian elders, were born into an environment of leadership and awe. Her sister, sometimes called “Bear”, was drawn to the sacred and became a Presbyterian minister. 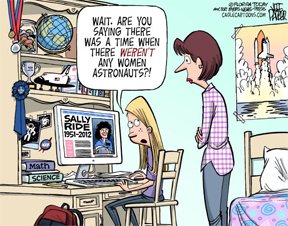 Sally was drawn to the secular, and became a physicist, astronaut, and role model for children who were drawn to science and adventure. She was a gifted tennis player, too. 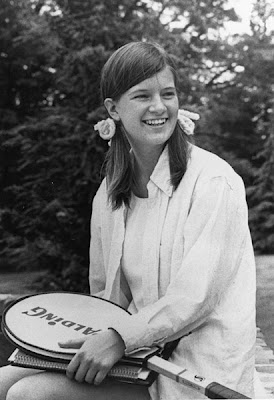 By her junior year in high school she was ranked eighteenth among girls nationwide, and was encouraged by no less than Billy Jean King to go pro. “I had a change of heart and decided to give [pro] tennis a serious try, and fortunately, that only lasted a couple of months,” she told an interviewer, but in the end science and math won out. “I was always very interested in science, and I knew that for me, science was a better long-term career than tennis. I went back to school and that was pretty much it.” Her interest for science was manifest early, and throughout junior high and high school she apparently never saw the memo about science being just for boys. “For whatever reason, I didn’t succumb to the stereotype that science wasn’t for girls. I got encouragement from my parents. I never ran into a teacher or a counselor who told me that science was for boys. A lot of my friends did.” “My parents didn’t have a scientific bone in their [bodies] and their daughter was pursuing a career in astrophysics. They didn’t even know what astrophysics meant, but they supported me.” She earned a bachelor’s degree in physics and English, and then a master’s and a doctorate in physics, all from Stanford, studying such arcane subjects as nonlinear optics and the interaction of cosmic x-rays with the interstellar medium. She joined NASA’s astronaut training program in 1978 with the first “class” that included women. “The astronauts who came in with me in my astronaut class – my class had 29 men and 6 women – those men were all very used to working with women.” Early in her career there she served as capsule communicator (CapCom) for the second and third flights of the space shuttle. She helped develop the robot arm that served the shuttle’s cargo bay, which she would later use in space to launch satellites into orbit. She was a fast learner, and that crash course in aerospace engineering was to serve her well through all of her NASA career. “On a standard space shuttle crew, two of the astronauts have a test pilot background – the commander and the pilot. 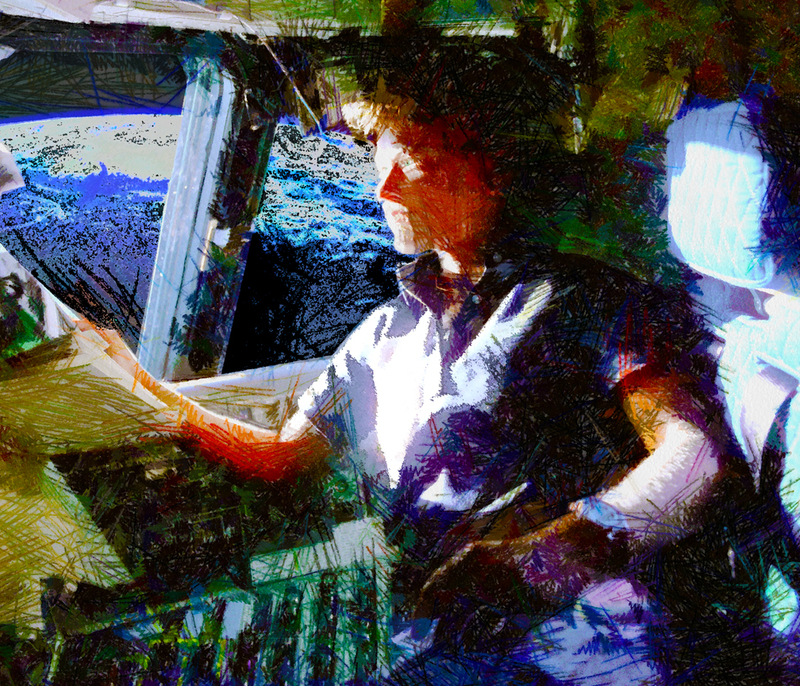 My background is in physics, so I was the mission specialist, who is sort of like the flight engineer on an airplane.” She managed experiments and oversaw the mechanical equipment aboard the spacecraft. 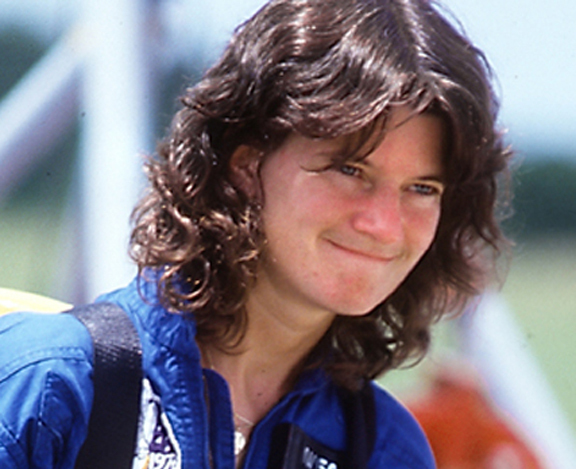 On June 18, 1983, the shuttle Challenger blasted into space on STS-7 with mission specialist Sally Ride aboard, the first American woman to orbit. “The most anxious time was during launch, just because that is so dramatic.” “Even though NASA tries to simulate launch, and we practice in simulators, it’s not the same – it’s not even close to the same.” Ride was not the first woman in space. Russian Cosmonaut Valentina Tereshkova had orbited for nearly three days in 1963 aboard the 1-person Vostok-3KA capsule, and Svetlana Savitskaya had spent almost twenty days aboard the Soviet space station Salyut-7 in 1982. Still, the experience of space is unforgettable: “When the space shuttle’s engines cut off, and you’re finally in space, in orbit, weightless… I remember unstrapping from my seat, floating over to the window, and that’s when I got my first view of Earth. Just a spectacular view, and a chance to see our planet as a planet.” Also banal: “The food isn’t too bad. It’s very different from the food that the astronauts ate in the very early days of the space program.” What do shuttle astronauts do all day? “Well, we spend an awful lot of our time working and doing experiments. 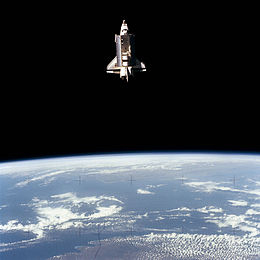 It’s very busy up on the shuttle.” She was, and still is, the youngest American to have orbited the Earth. The mission went flawlessly, and all work and experiments completed, the reentry was perfect. Dr. Ride flew on the Challenger again as a Mission Specialist on STS 41-G, which launched from Kennedy Space Center on October 5, 1984. 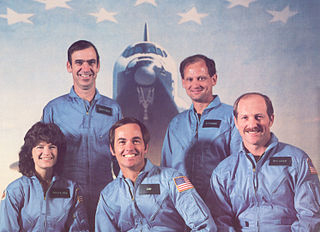 This time the shuttle carried the largest crew to fly so far, including Captain Robert L. Crippen (spacecraft commander, who also commanded STS-7), Captain Jon A. McBride (pilot), fellow Mission Specialists, Dr. Kathryn D. Sullivan and Commander David C. Leestma, as well as two payload specialists, Commander Marc Garneau and Paul Scully-Power. “On both of my flights, everything went very well.” It was in fact another flawless mission. In June 1985, Dr. Ride was assigned to the crew of STS 61-M, but that mission never flew. All shuttle mission training was shut down abruptly in January 1986 when the space shuttle Challenger failed catastrophically over the Atlantic 73 seconds after liftoff, killing its crew of seven. 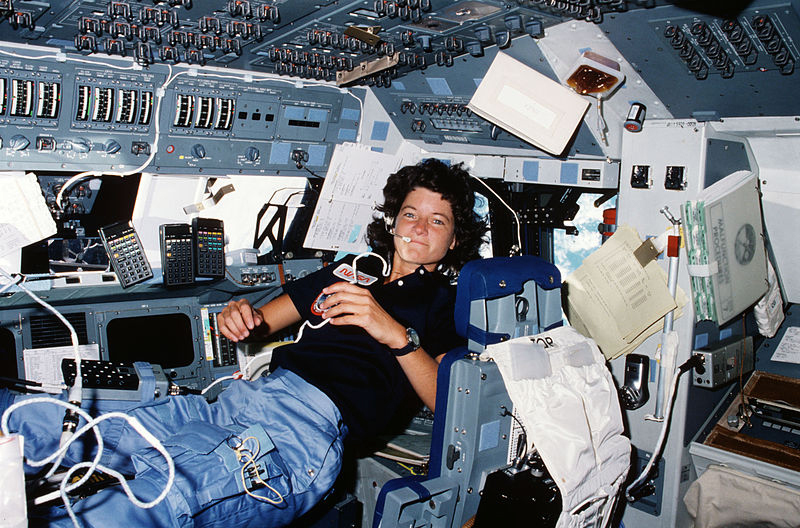 Sally Ride never went into space again. 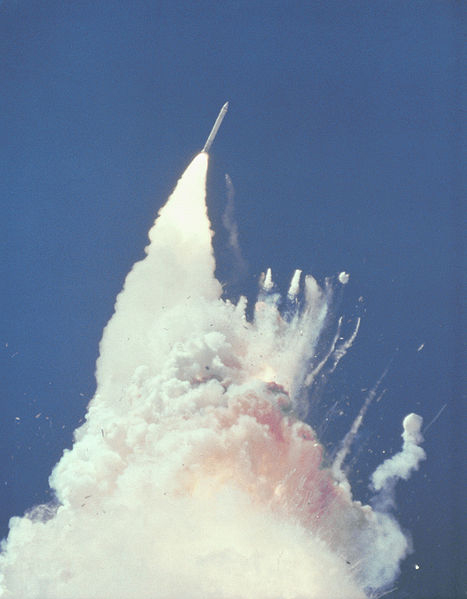 A presidential commission, headed by former secretary of State William P. Rogers, was appointed by Ronald Reagan to investigate the Challenger disaster. Ride was a natural to be appointed to this commission. Not only was she expert in physics and engineering, she was also intimately familiar with the shuttle program in general, and the Challenger in particular. She brought another, equally valuable asset to the Commission as well: “I have a lot of common sense. I know what needs to be done and how to approach it. I have an ability to work with people on large enterprises.” The Rogers Commission found both engineering and procedural defects contributed to the disaster. “After the Challenger accident, NASA put in a lot of time to improve the safety of the space shuttle to fix the things that had gone wrong.” “The space shuttle is a better and safer rocket than it was before the Challenger accident.” In 2008, after the Space Shuttle Columbia disintegrated on re-entry, Dr. Ride was again enlisted to investigate that disaster. After NASA, she served as a scientific member of the Stanford University Center for International Security and Arms Control. She became a professor of physics at the University of California at San Diego and a consultant to NASA on several projects, in cooperation with the Jet Propulsion Laboratory. She is the recipient of a huge number of honors and awards for her contributions to science, academia, and space exploration. Her most lasting legacy may be her contribution to making science, technology, engineering and mathematics (STEM) careers acceptable choices for women as well as men. “If you ask an 11-year-old to draw a scientist, she’s likely to draw a geeky guy with a pocket protector. 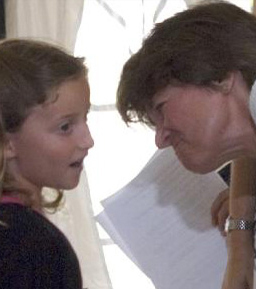 That’s just not an image an 11-year-old girl aspires to.” By her example, and with her plain talk, all-American good looks and boundless energy, she made science accessible and way cool. Few schoolgirls had Sally’s academic brilliance or her athletic prowess. Far fewer had the bold drive that led her into space. “I never went into physics or the astronaut corps to become a role model. But after my first flight it became clear to me that I was one. And I began to understand the importance of that to people. Young girls need to see role models in whatever careers they may choose, just so they can picture themselves doing those jobs someday. You can’t be what you can’t see.” She co-wrote seven books for children and young adults on space subjects, and developed two outreach projects for NASA aimed at middle school students, all meant to inspire young people to study science and pursue STEM careers. On Sesame Street she sponsored the letter A (for astronaut). She also appeared with Muppets on Fraggle Rock. 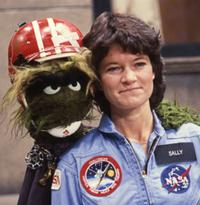 With her partner Tam O’Shaughnessy, a childhood friend and fellow elite tennis hopeful turned science professor (psychology, in Tam’s case, at San Diego State), she founded Sally Ride Science, a company that produces engaging science programs for elementary and middle school students, especially girls. She liked to quote fellow astrophysicist Carl Sagan: “It is suicidal to create a society that depends on science and technology…in which no one knows anything about science and technology.” “If we want scientists and engineers in the future” she said, “we should be cultivating the girls as well as the boys.” There is no way to know how many women have entered, or are preparing to enter, STEM careers because of her influence on their attitudes about themselves and about science. 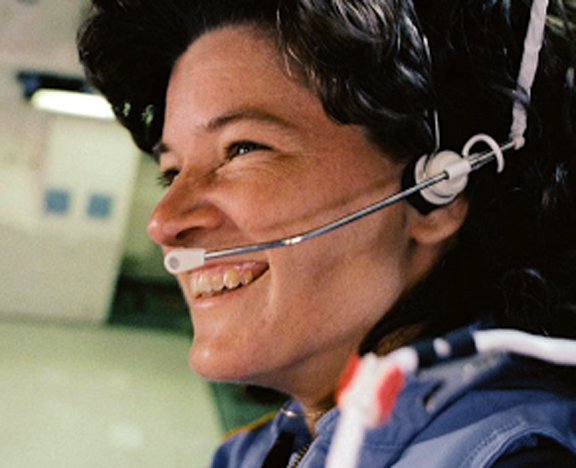 Elementary schools in Texas and Maryland have been named after Sally Ride.